Electricity can be used to power all-electric vehicles and plug-in hybrid electric vehicles directly from the power grid. Electric vehicle adoption can reduce fuel costs, lower vehicle emissions and reduce our nationâ€™s dependency on foreign sources of energy. All-electric vehicles (EVs), such as the Nissan LEAF and the Tesla Roadster, use a battery to store the electrical energy that powers the motor. EV batteries are charged by plugging the vehicle into an electric power source. All-electric vehicles have zero tailpipe emissions and well-to-wheel emissions are consistently lower than those of conventional and hybrid electric vehicles, even when the grid is powered by coal. Because EVs use no other fuel, widespread use of these vehicles could dramatically reduce petroleum consumption. The average 100 mile range of these vehicles limits their use to intra-regional travel, but the installation of DC Fast Chargers and improved battery technology is enabling more inter-regional travel. Plug-in hybrid electric vehicles (PHEVs), such as the Chevy Volt, are powered by conventional or alternative fuels and by electrical energy stored in a battery. Using electricity from the grid to run the vehicle some of the time costs less and reduces petroleum consumption compared with conventional vehicles. PHEVs can also reduce vehicle emissions, depending on the electricity source. PHEVs on the market today have an â€œall-electric rangeâ€ of 15 to 40 miles, but the auxiliary gas engine provides an additional 200 to 300 miles of range when needed. 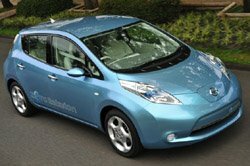 The Asheville Area Electric Vehicle Committee is a collection of local governments, utility providers, businesses, academic institutions, and non-profits created by the Land-of-Sky Clean Vehicles Coalition to prepare the Asheville Metro Area for plug-in electric vehicles. For information on Electric Drive Vehicles and our Asheville Area Electric Vehicles Initiative, contact Brian Taylor at 828-251-6622, Brian@LandOfSky.org, and visit our EV Initiative website on the Advantage Green Network.